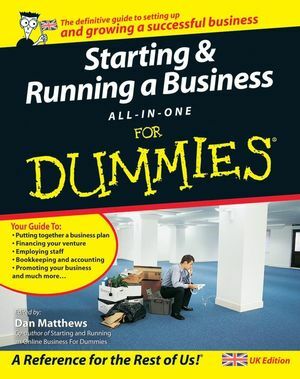 Written by a team of business and fi nance experts, Starting & Running a Business All-In-One For Dummies is a complete guide to every aspect of setting up and growing a successful business. Featuring straight-talking advice on everything from business planning and marketing, managing staff and dealing with legal issues, to bookkeeping and taking care of tax obligations, this book is your one-stop guide to turning your business plans into profit. Dan Matthews is co-author of Starting and Running an Online Business For Dummies and is Online Publisher of Caspian Publishing, which produces magazines, Web sites, and events for a UK audience of entrepreneurs. Book I: Where to Start? Chapter 1: Preparing for Business. Chapter 2: Being Your Own Boss. Chapter 3: Can You Do the Business? Chapter 4: Starting Your Business Plan. Chapter 5: Establishing Your Starting Position. Chapter 6: Researching Your Customers, Competitors, and Industry. Book II: Money in Mind. Chapter 1: Finding the Money. Chapter 2: Figuring Out Financials. Chapter 3: Cash Flows and the Cash Flow Statement. Chapter 4: Forecasting and Budgeting. Book III: Getting the Staff. Chapter 1: Staying on the Right Side of the Law. Chapter 2: Finding Person Friday – Advertising and Interviewing. Chapter 3: Employing People Successfully. Chapter 4: Disciplining and Dismissing Staff. Chapter 5: Paper Money, Money Paper – Payslips and Deductions. Chapter 6: Inspiring Employees to Better Performance. Chapter 7: Coaching and Development. Chapter 8: Tackling Performance Appraisals. Book IV: How Not to Cook the Books. Chapter 1: Working for Yourself Can Be Less Taxing. Chapter 2: Filling In and Filing Your Self Assessment Form. Chapter 3: Getting Down to Bookkeeping Basics. Chapter 4: Controlling Your Books, Your Records, and Your Money. Chapter 5: Producing a Profit and Loss Statement. Chapter 6: Developing a Balance Sheet. Book V: Bigging Up Your Business. Chapter 1: Taking a Closer Look at Customers. Chapter 2: Marketing Your Wares. Chapter 3: Writing a Marketing Plan. Chapter 4: Brochures, Press Ads, and Print. Chapter 5: Signs, Posters, and More. Chapter 6: Public Relations and Word of Mouth. Chapter 7: Planning Your Business Web Site. Chapter 8: Choosing and Equipping Your New E-Business. Chapter 2: Managing More Than One Product. Chapter 4: Franchising for Growth. Chapter 5: TV and Radio Ads (or Your Own Show!). Chapter 6: Becoming a Great Manager.